Warning: non TCDD steam loco (industrial or otherwise) and locos out of inventory before TCDD was founded are not listed. During the Ottoman time, the various private companies procured their motive power mostly from the home country of their stockholders. Then, having no national engines manufacturing, TCDD continued to purchase imported engines. Consequently Turkish engines are coming mostly from Germany, England, France and United States. TCDD relied on existing proven design and the western railway enthusiasts will often recognize engines already seen at home. The Turkish network is quite demanding. It is a mountain network with steep gradient and sharp curves. On the Anatolian plateau the average altitude is near 1000 m. The weather is hot and dry in the summer. But it is often forgotten that, inland, the winter is very cold and with a lot of snow. For these reasons, Turkish engines are "small wheels", four and then five driving axles became quickly the norm, the first Decapod (1'E) where used in the 1920's. Since speed was not feasible, the same engines could be used on freight as well as passenger trains and most of the engines are of "mixed" type. Double heading plus banking was common: it was not rare to see four Decapods working on the same train. But articulated engines were not successful in Turkey: one Garratt have been tried and a few Mallets have been used in the 1920's but they were taken out very quickly. Mallet should have been very successful but my guess is that the lack of capital finance prevented TCDD from buying them. Maybe someone can provide additional explanation? The first digit indicates the number of driving axles. The second digit indicates the total number of axles of the engines. The following digits are the engine serial number. Two digits are used for tank engines; three digits are used for tender engines. Engine n° 56501 refers to a 1'E (2-10-0). Decapods being quite common on the Turkish network, the number 56xxx is frequently encountered. As seen above, TCDD is not using a strict "class" number or designation for each type of engines. However in most cases, serial numbers in sequence are usually used for identical engines. Therefore, the first numbers of the series are used as a proxy for class number. For example 56301 refers to the Vulcan Foundry Decapods, 56501 is the type BR52 Kriegsloks. Unfortunatly, there are several case of identical engines numbered in non following sequence. A classic example is the CFOA 1'C numbered by TCDD 34001 to 34018 and 34046 to 34048. The serial numbers are not indicating the years of acquisition. For example, the 56301 are 1948/49 engines whereas the 56911 are 1926/27 engines. Numbers are not indicatives of the gauge either. And of course, like any self-respecting railway, TCDD as some overlapping numbers, missing numbers and other oddities! Soon after the start of the First World War the Ottoman Empire signed an alliance treaty with Germany (August 2, 1914) and declared war on France and UK on November 5, 1914. This started a time of great turmoil for Ottomans railways. The Ottomans had to fight on multiple fronts several thousand kilometers apart (Dardanels, Baghdad, Palestine, Erzurum, …) and the meager railways resources were soon stretched out. The German provided assistance to complete the Baghdad Railways and they send war engines, mostly G8 but also G51, G54, G71, G72 and G81. Some British ROD 060 GWR Dean Goods found their way to the ORC and then to TCDD. They were presumably shipped to Turkey when Istanbul and part of the CFOA was under British control in 1918/1922. On top of all, these engines were working with units from world war one (mostly German G8), and at the Syrian Border, they met DHP Austerity 2-10-0! Preserved Engines page for a list of steam engines still existing. 3326 3329 C't 3 1913 Hanomag Nbr 3326, 3327, 3329: ex Baghdad Rly. 46230 46253 1'D1' 24 1942 ALCO, Baldwin, Lima USATC S200 "Middle East" Class, Ex MEF /IqSR, purchased in 1946. 56301 56388 1'E 88 1947/49 Vulcan Iron Works (USA) "Skyliners"
56501 56553 1'E 53 1943 Henschel, Borsig, MBA, Schwarzkopff, WLF BR52 "Kriegslok"
56901 56910 1'E 10 1917 Henschel Transition design between the G121 and the BR44. These loco were taken over along with the broad gauge line to Kars. TCDD had one class of steam railcar. These units saw little service and where quickly withdrawn. Despite a network combining sharp curves and steep gradients, TCDD never acquired articulated steam engines and stick to Decapods. 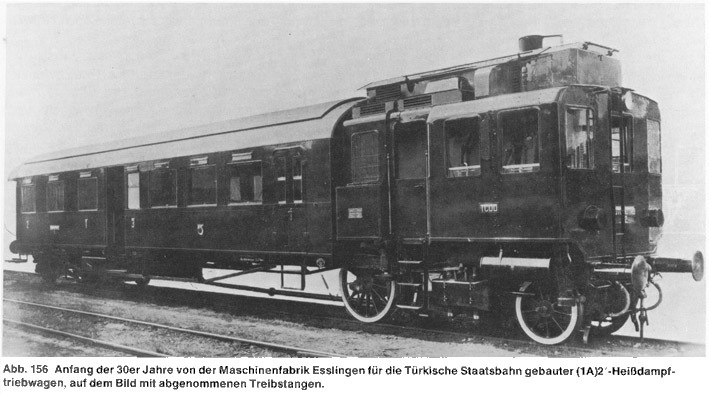 Private companies before TCDD experimented some articulated locomotives. It is likely that some of these engines were still in operation when TCDD took over from their previous owners. TCDD itself reports some large engines to UIC. However, we have no evidence of TCDD actually giving inventory number to any of these locomotives. The Russian army used briefly some 1067mm gauge Garrat on the eastern front during WW1.